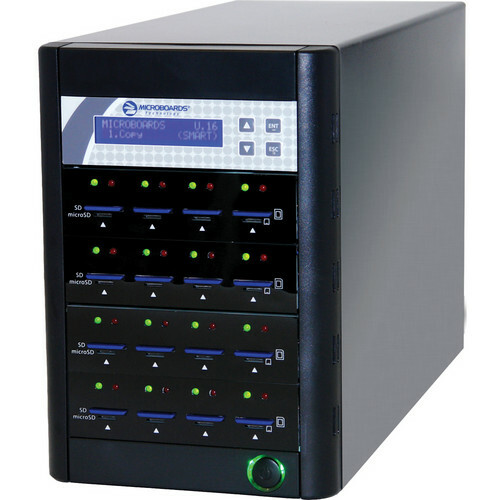 Microboards 1:15 Copywriter SD/MicroSD Card Duplicator is a standalone, simple, fast, easy-to-use system for copying and erasing up to 15 SD or MicroSD flash cards simultaneously. To make copies with this duplicator, simply insert your master thumb drive, fill the remaining slots with blank devices, and then press the OK button. You need not make all of your copies at once. Fortunately, fully asynchronous copying technology and a large memory cache allows for every slot to operate independently. So, you can copy jobs of any size and permit target devices to be unloaded and loaded on the fly, instead of having to unload and reload all of your flash memory cards at a time. As soon as a slot signals ready, you can remove the finished, copied media and insert another blank device. Bit-level comparison technology ensures a successful copy every time. Beyond copying, you can also use the duplicator to erase content from SD Cards and MicroSD Cards, leaving you with a clean, unformatted device. As the cost of flash memory comes down, the distribution of information on flash becomes more and more viable for companies in the following areas: Marketing/Communications, Field Sales Support, Education, Government, Engineering, Audio/Video, Publicity, and more! With this duplicator, you have the ability to make multiple copies quickly, reliably, and without effort. Box Dimensions (LxWxH) 20.0 x 10.9 x 10.0"
1:15 Copywriter SD/MicroSD Card Duplicator is rated 5.0 out of 5 by 1.